In a schematic and very simple way, the primary processes of a company can be represented as in the figure. Thus, operations include processes that represent the daily activity of the company, from customer acquisition, sales, marketing, etc., to all processes in the supply chain. Support processes include all HR, IT, Finance, Administration, Maintenance etc. activities, ie all those who support the operational activity and also the process of innovation, whose activities are oriented to the future of the company. 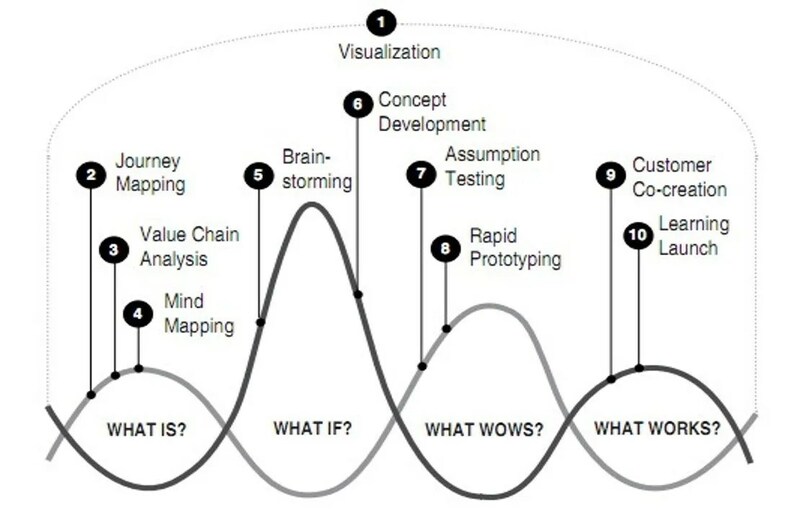 There has been very much described about “Push” and “Pull” models of the innovation process. In practice, innovation is an iterative process of trial and error where openness and communication are critical elements. Sometimes the “push” dominate, sometimes the “pull”, but the success of innovation requires an interaction between the two. The typical models of each case are, in the case of “Push” or Technological Innovation, based on applying new scientific advances and technological developments to products and services to introduce them to the market. In the case of “Pull”, it is the need of a market or segment that pulls the development of this new product or service applying new technologies, scientific advances or not. The “natural” development of existing technology leads us to try and design new products and / or services, one of which is decided to launch the market. A scientific or technological leap from which a new concept emerges and from it new designs that we end up presenting to the market as a new product or service. We start from an “invention” or change of “paradigm” to find a place in the market and to provoke a demand that favors the commercialization. It is a problem solving methodology especially suitable for investigating ill-defined problems, which focuses on the human being, focused on the possibilities and oriented to the hypotheses. 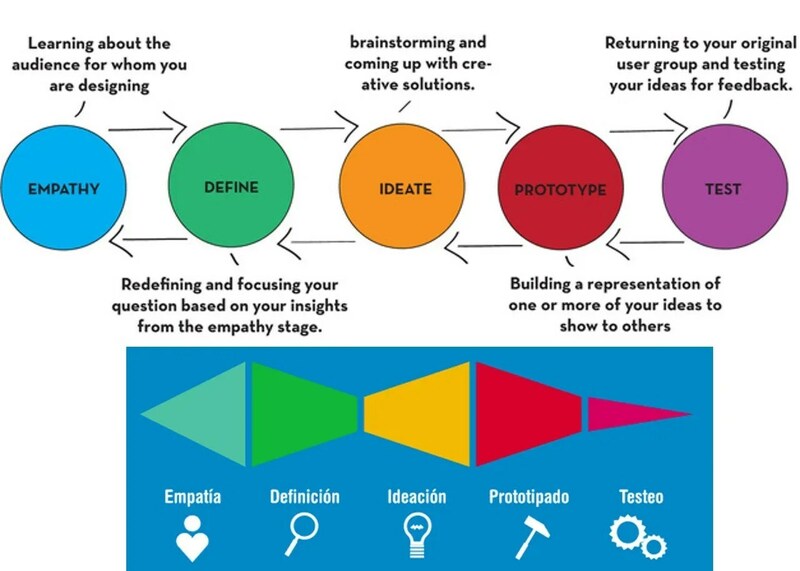 It is a thinking model that combines empathy with users and immersion in the context of a problem, creativity in generating ideas and solutions and an experimental approach based on data to evaluate the quality of solutions. Focus on people-centered innovation, where behaviors are deeply examined to find real needs, finding ideas that guide designing solutions, prototypes, and validate with real customers, iterating until they find the best fit. Visualization: Use of images to visualize the possibilities. Journey Mapping: Evaluation of existing experience through the eyes of the client. Analysis of the value chain: evaluation of the current value chain that accompanies the customer experience. Mental Mapping: generating ideas from exploration activities and creating design criteria. Brainstorming: generating new possibilities and new models. Concept development: bringing together innovative elements into a coherent alternative solution that can be explored and evaluated. Co-creation with the client: involve clients to participate in the creation of the solution. An extended chain of innovation is understood from the creation of new knowledge and technologies, until its launch or actual application in a sector of society or the market. It includes agents outside the company, such as universities, technology institutes, research centers, etc. Both private and public or mixed. In an open innovation process, they are equally important to be considered. The same innovation process does not work everywhere the same. Experience shows that the environment and culture, educational level, experience and social organization, industrial structure and efficiency of institutions and administration, have great influence on the success or failure of any model of innovation. The conditioning factors, both of internal culture and organization and of its environment are key in its functioning. It is therefore not surprising that the same company, even the same team, with the same model and innovation process, is successful and produces excellent results in one environment or in one country and is a failure in another. 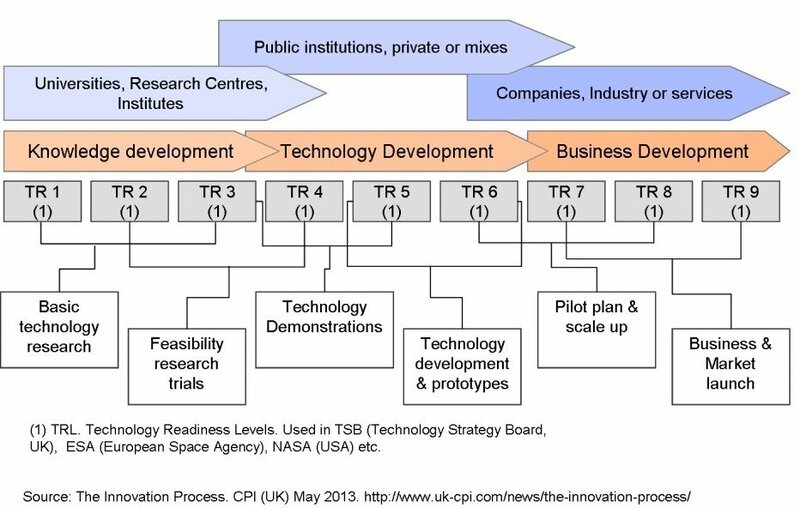 The following diagram shows a simplified model of extended innovation chain, which includes from basic research and developing new technologies to the launch of products or services to the market. It is based on so-called ‘Technological Readiness Levels’ model or TRL. 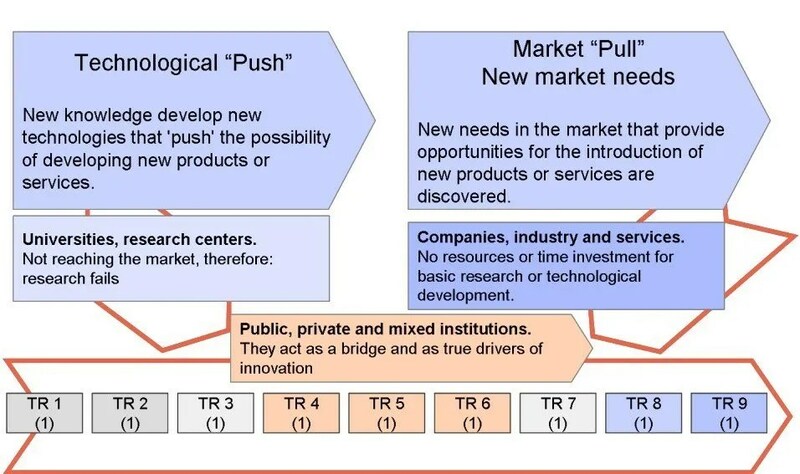 In the diagram below, the approach combines technological “push” with the “pull” of the market, to foster those ideas that universities and companies alone are not prepared to develop due to the lack of adequate connections or high capital costs Involved. Enter into the correct mental model or right paradigm. Finding and working with the right people. The following diagram relates previous approaches to the process of concurrent development, from ideas to market. A company is in a much stronger position to obtain and realize the value by having a prototype with international protection of Intellectual Property (IP) and sufficient elements for production investment. This is where an independent centre of technological innovation can help. These centres, public, private or mixed institutions also serve to catapult the experience in a wide range of technologies and services, and have appropriate teams to demonstrate the process /product and to show feasibility before investing large amounts of money. This allows to develop, test and scale the prototype, product, in laboratory and plant trials before being manufactured on an industrial scale.